What it takes to be a Chocolate Diamond®? Not every brown diamond qualifies for the stringent standards that Le Vian sets for Chocolate Diamonds. So what sets Chocolate Diamonds apart? Le Vian arms its trained diamond buyers with a list of criteria used to source only the best brown diamonds, including considerations such as color, clarity, size, and cut. The strength of color is one of the most important factors in determining the value of a natural color diamond. Chocolate Diamonds must have a certain hue, tone and saturation, rating between C4 and C7 on Argyle’s color scale. Brown diamonds within that range are the richer, deeper champagne colors, and correspond to the fancy dark browns on the Gemological Institute of America’s color chart. The richer the color saturation and the darker the tone of color of the natural brown diamond, the more rare that diamond is considered. Chocolate Diamonds must have a clarity of SI or higher — Slightly Included means it’s “eye clean,” so that inclusions aren’t visible to the naked eye. Note that fewer than 5% of the diamonds from the Argyle mine meet these standards. Stones larger than 20 points (1/5 carat) are the top 5% of those, and Chocolate Diamonds of one carat or larger are 1 in 10,000 — almost impossible to find. Of course, once the Chocolate Diamonds® are sourced from the mine, they are then cut to Le Vian’s exacting standards. We branded our brown diamonds because Le Vian believes in its standards for finding and selecting rare, high quality natural brown diamonds sets it apart from other sources for brown diamond jewelry. 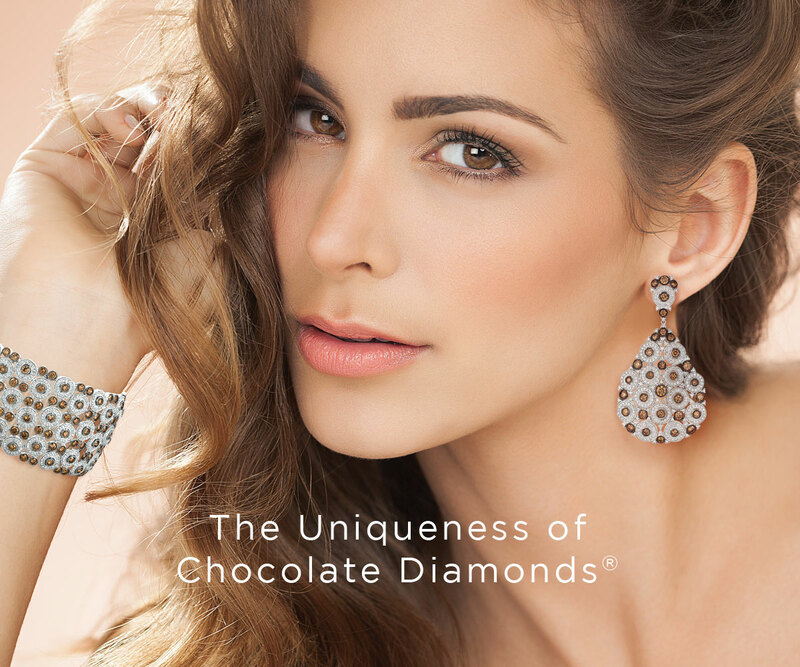 In order to distinguish itself, Le Vian has coined the term Chocolate Diamonds® to indicate a select and exacting standard for natural fancy color brown diamonds that it uses in its innovative and unique jewelry. Le Vian® obtained a registered trademark of Chocolate Diamonds®, so consumers would be assured that these branded diamonds are of the highest quality, meeting specific standards of what it takes to be a Chocolate Diamond®. 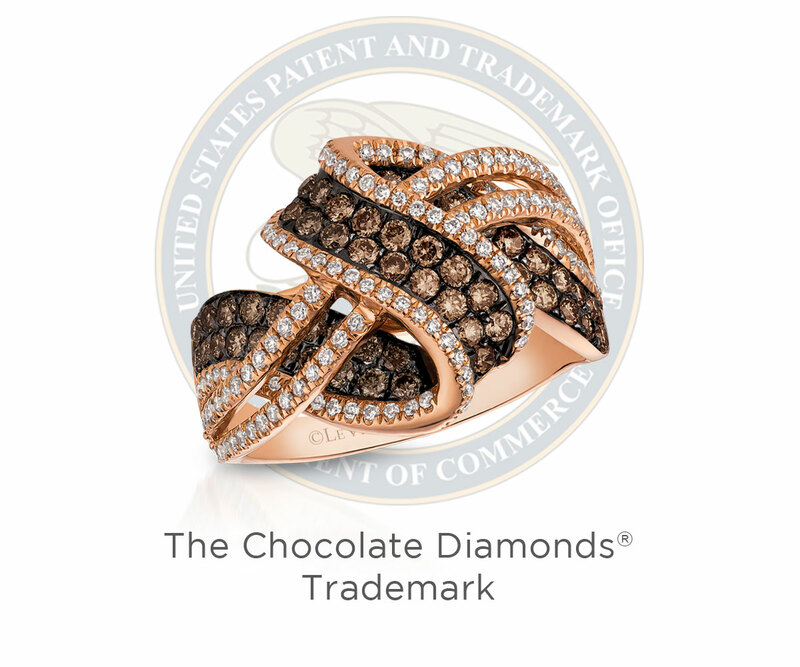 Currently, Le Vian holds the registered trademark for Chocolate Diamonds in countries around the world, spanning the Americas, the European Union, China, and the Middle East. 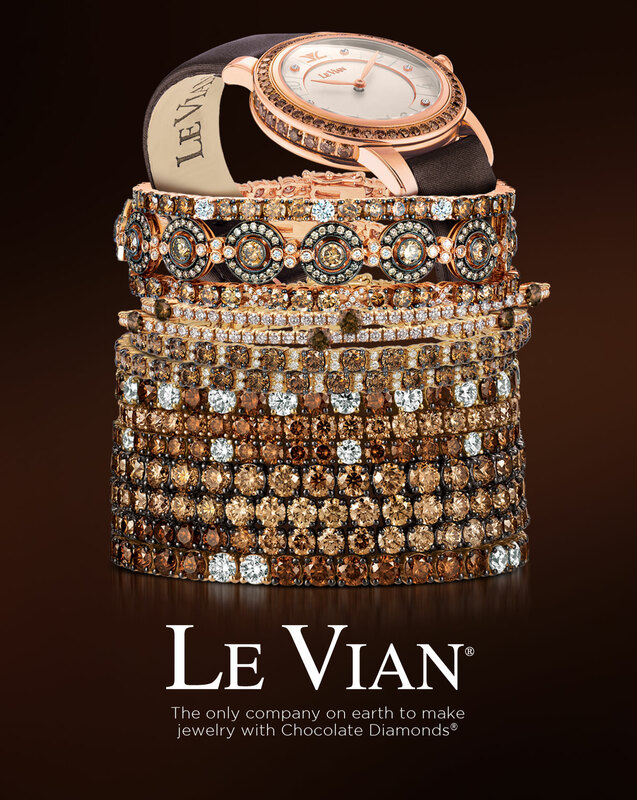 All of Le Vian’s Chocolate Diamonds are Unique, Affordable, and Fashionable. Here’s why. The color results from a combination of three different elements — hue, tone, and saturation — and there are millions of combinations of these elements that create each diamond’s look. So, when you get a one-carat Chocolate Diamond®, all the many possible variations make each diamond unique. This is of course true of all natural-color diamonds, and it’s the reason they are so valued. People are looking for something different, something no other collector can get no matter how much they’re willing to pay. Today, women find themselves in a world of mass production, where there are thousands of the same dress and other apparel sold across the country. Trying to stand out from the crowd and achieve a sense of individuality becomes a challenge when you’re fighting the tide of mass consumerism. That’s why Chocolate Diamonds® — and Le Vian’s original designs — appeal to women who want to have something as unique as they are. For many years, women were limited to certain styles of jewelry and even those styles were not within their means. Today women want something unique, something different, more fashion forward. And that is where Le Vian’s unique, innovative designs combined with rare Chocolate Diamonds meets that demand. Chocolate Diamonds are Le Vian’s brand of brown or golden-hued natural diamonds, carefully selected for their rich deep colors. Only natural diamonds that meet Le Vian’s exacting standards of clarity, quality, cut, and color will be worthy of the name Chocolate Diamond®. 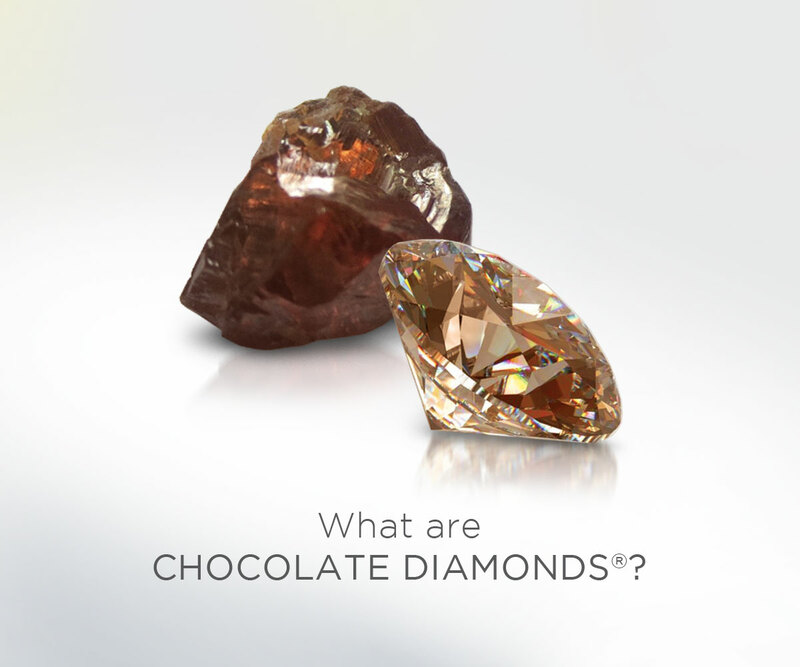 What gives Chocolate Diamonds® their color? In a word, pressure. The diamonds are formed deep in the earth where they are subjected to an incredible amount of heat and pressure. This causes the crystal lattice to distort in such a way that the stone absorbs light in the blue region of the spectrum. The resulting reflected color you see is anywhere from a light champagne to a rich cognac to the deep-colored stones we call Chocolate Diamonds®. Where can I get authentic Le Vian Chocolate Diamonds Jewelry? Visit one of Le Vian’s authorized retailers to ensure that you are purchasing authentic Le Vian Chocolate Diamonds jewelry. For a full list of authorized retailers near you, visit Le Vian’s home page and click on the “Retailers” button on the top of the page. If you have any questions about retailers or whether a jewelry piece is authentic Le Vian, please contact Le Vian’s customer service at 516-466-7200 or customerservice@levian.com. How can I be sure I’m buying a true Chocolate Diamond®? Le Vian provides a guarantee in writing that their diamonds are genuine. You never need to worry about getting an imitation or artificial stone when you buy a certified Chocolate Diamond® from one of Le Vian’s authorized retailers. Also, if you buy a stone of 1/2 carat or larger, it will be laser-inscribed with the Chocolate Diamonds® brand on the girdle. 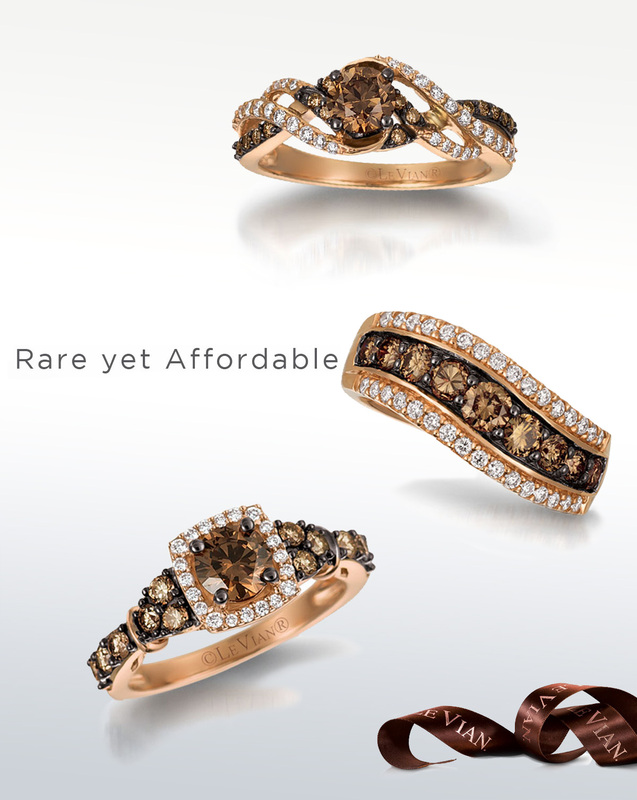 How rare are Chocolate Diamonds®? According to Rio Tinto, the mining company that owns the Argyle mine where Chocolate Diamonds come from, fewer than 1% of all polished diamonds produced in the world qualify as Chocolate Diamonds®. And the larger stones are even rarer. For example, you can find one-carat white diamonds everywhere, so they’re hardly unique. But Chocolate Diamonds® of 20 points (1/5 carat) or larger are 10,000 times rarer than white diamonds. No wonder they’re in such demand. What is the appeal of Chocolate Diamonds®? There’s a trend these days to “dressing down” and not being so ostentatious with flashy jewelry. The trouble is, those traditional white diamonds can look a bit too showy, too sparkly. And a lot of colored diamonds are simply beyond the reach of most people. Chocolate Diamonds® — with their earthy, golden tones — perfectly suit the needs and desires of those who want something they can wear with any outfit and any occasion. They are the most affordable fancy colored diamonds you can find. Are Chocolate Diamonds® Responsibly Sourced? Yes! When you purchase Le Vian Chocolate Diamonds jewelry, or any Le Vian jewelry, you can rest assured that the components have been responsibly sourced. Le Vian has committed to and is independently audited against the Responsible Jewelry Council (“RJC”) Code of Practices – RJC is the leading industry organization that sets international standards for responsible business practices for diamonds, gold and platinum group metals. The Code of Practices addresses human rights, labor rights, environmental impact, mining practices, product disclosure and many more important topics in the jewelry supply chain. Le Vian joined the RJC in 2013 and became a certified member in 2015 after undergoing an extensive audit of its entire operations against the RJC Code of Practices. Since then it has worked with industry leaders to maintain and continue its efforts of responsible sourcing, including diamond sourcing. Le Vian stays committed to these standards and continuously implements best practices and continues to audit against the RJC Code of Practices. Visit Le Vian’s CSR link to learn about all of our corporate responsibility standards.